Sitting still? Movement is natural! Your body knows what’s good for it. We see that in our children every day. However, when we tell them to sit still or when we scold them for tipping their chair, we are, in fact, teaching them to sit wrongly because there’s nothing better we can do for our backs when sitting than staying in motion. 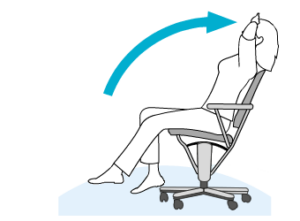 Active, dynamic sitting involves frequently altering our sitting position, thus encouraging the mobilisation of the musculoskeletal system. Even the subtlest changes of posture help, such as a shift of weight, a tensing of muscles, even breathing. The alternation between tensing and relaxing trains the back muscles and stimulates circulation. Due to the constant movement, the intervertebral discs are supplied with the necessary nutrients. Your breathing deepens, you relax and you can concentrate much longer on whatever you’re doing. Our bodies are not made for sitting. Nature designed our bodies with movement in mind, and yet we spend up to 85% of our waking hours sitting! We all know the result – back problems are among the most common ailments. We really can’t avoid sitting whilst studying, working or during our free time. What we can do, however, is change the way we sit. And we can tell you how! Back and forth – keep moving. 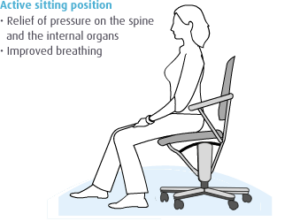 If you work a lot at a desk, then a frequent change of sitting position is particularly recommended. Our chairs promote precisely that. In the active sitting position, the seat is tipped forward. This results in an automatic straightening up of the upper body and the pelvis tips slightly forward. This creates an open angle between your torso and thighs which, in turn, relieves pressure on the spine and internal organs and improves breathing. 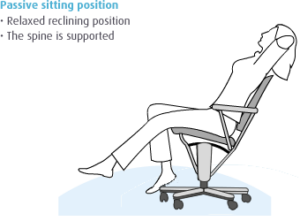 In order to change to the passive sitting position, all you have to do is relaxedly lean back. Your MOIZI chair has an ergonomically shaped backrest with an integrated lumbar support which helps retain the natural ‘S’ shape of the spine. Incidentally, the ‘S’ shape of the spine doesn’t develop in children until around the age of 12. Chairs with lumbar supports are, therefore, not suitable for children under the age of 12. For this reason, our chairs for children and teenagers have a straight backrest.